This swing is ideal for little ones in the age group 1year to 3year. it is a swing that goes back and through gently and not too fast for the little ones. Something new, a little merry a round for the little ones between the ages 3 - 6. They turn themselves around and at the speed they want. No need for someone to turn them around. Just sit and relax while the children play. Swing with 2 tyres for play along friends. 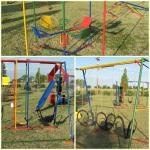 Monkey bars, steel swing, tyre swing, drum and a slide.